The only really annoying thing about having cats is the kitty litter everywhere. It seems like every time a cat uses the box, they either dig and get litter all over the place, or they step out with litter on their feet and it gets into your carpets. Most litter mats are useless to catch the stuff. But now there’s a great solution! Disclosure: I received a free Smiling Paws litter mat for the purposes of this review, but Paws and Effect never shares information or products we don’t believe in. We are not receiving any compensation for mentioning this brand, nor are we receiving revenue from affiliate links. I’ve tried a lot of litter mats, from throw rugs to expensive double-layered honeycomb-style ones, but the Smiling Paws litter mat is the best I’ve ever used. There are three big things going for the mat itself. It’s big enough. I always recommend that cat guardians use the largest litter box they can find in order to avoid litter box problems. 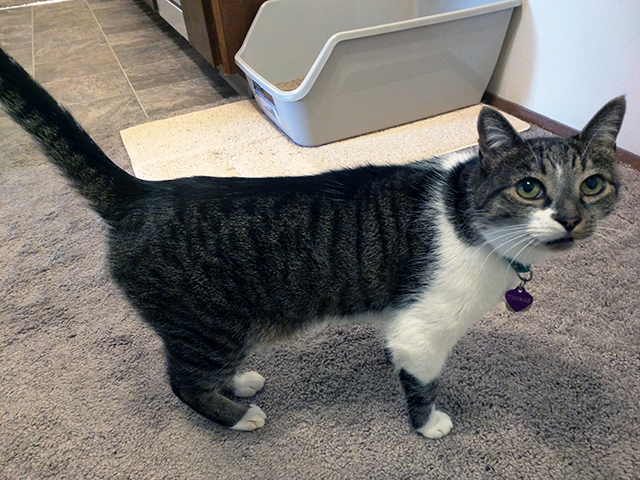 The Smiling Paws litter mat is 35 inches long by 23-1/2 inches wide, more than enough to fit my 24 x 18-inch litter box with room to spare. 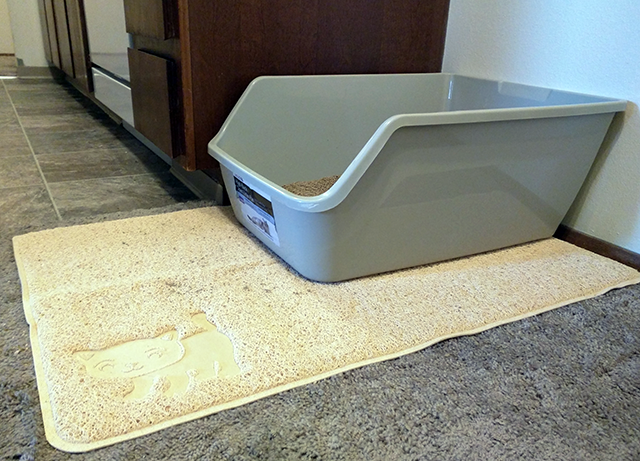 Very few litter mats are built to fit under large litter boxes. 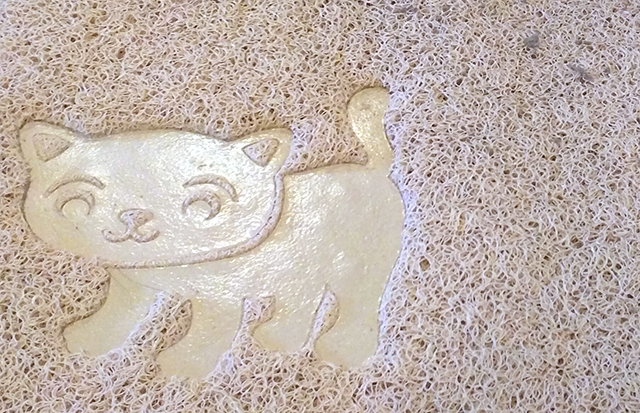 The Smiling Paws litter mat is more than big enough for my litter box. It actually catches litter. The Smiling Paws litter mat is made of a loofah-like material that traps cat litter that would otherwise be scattered around my house and in my carpets. I live in a rental unit with wall-to-wall carpeting, so it’s great to have a mat that’s easy to clean and prevents me from having to vacuum up mass quantities of litter. The cats like it. This is clearly the most important thing of all. If the cats won’t use the litter box with a mat, there’s no point in even having one. On a decor and design note, it comes in a variety of colors. I got the beige mat, but it also comes in gray, brown, and black. The loofah-like material catches lots of litter and is soft on kitty paws. Those factors alone would be enough to make me love the Smiling Paws litter mat. But I don’t just love the mat; I love the company, too. Smiling Paws is a small, family-run company that has been in business since 2008. They just started selling their products online last year, and I’m glad they did; otherwise, I never would have heard of them! Their customer service is amazing. As soon as my litter mat shipped, I received an email letting me know that. They also sent instructions on how to unroll and unfold the mat so it lays flat. A few days after I received the mat, they sent me an email checking in and asking if I had any questions or problems. Small businesses that go the extra mile with awesome customer service are definitely worth supporting. The Smiling Paws litter mat ordinarily costs $35.00, but it’s on sale right now for $24.95. You can buy it through their own website, or you can purchase it through Amazon or eBay. I strongly recommend purchasing directly through the website, so your entire purchase price goes directly to the business. Our review: Four Paws Up!